This is a slightly edited version of an article originally published under the title "Islamic Jihad: Symptom of a Western Cause." 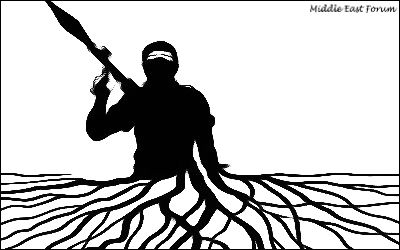 So what is the root cause of jihadi attacks? Many think that the ultimate source of the ongoing terrorization of the West is Islam. Yet this notion has one problem: the Muslim world is immensely weak and intrinsically incapable of being a threat. That every Islamic assault on the West is a terrorist attack—and terrorism, as is known, is the weapon of the weak—speaks for itself. This was not always the case. For approximately one thousand years, the Islamic world was the scourge of the West. Today's history books may refer to those who terrorized Christian Europe as Arabs, Saracens, Moors, Ottomans, Turks, Mongols, or Tatars—but all were operating under the same banner of jihad that the Islamic State is operating under. No, today, the ultimate enemy is within. The root cause behind the nonstop Muslim terrorization of the West is found in those who stifle or whitewash all talk and examination of Muslim doctrine and history; who welcome hundreds of thousands of Muslim migrants while knowing that some are jihadi operatives and many are simply "radical"; who work to overthrow secular Arab dictators in the name of "democracy" and "freedom," only to uncork the jihad suppressed by the autocrats (the Islamic State's territory consists of lands that were "liberated" in Iraq, Libya, and Syria by the U.S. and its allies). Postmodern thinking enables Islamists to challenge a militarily and economically superior West. So are Western leaders and politicians the root cause behind the Islamic terrorization of the West? Close—but still not there yet. Far from being limited to a number of elitist leaders and institutions, the Western empowerment of the jihad is the natural outcome of postmodern thinking—the real reason an innately weak Islam can be a source of repeated woes for a militarily and economically superior West. Remember, the reason people like French President Francois Hollande, U.S. President Barack Hussein Obama, and German Chancellor Angela Merkel are in power—three prominent Western leaders who insist that Islam is innocent of violence and who push for Muslim immigration—is because they embody a worldview that is normative in the West. Postmodernism holds that there are no absolute truths, and thus all cultures are fundamentally equal and deserving of respect. Taken together, these cornerstones of postmodern, post-Christian thinking hold that there are no absolute truths and thus all cultures are fundamentally equal and deserving of respect. If any Western person wants to criticize a civilization or religion, then let them look "inwardly" and acknowledge their European Christian heritage as the epitome of intolerance and imperialism. Add to these a number of sappy and silly ideals—truth can never be uttered because it might "hurt the feelings" of some (excluding white Christians who are free game), and if anything, the West should go out of its way to make up for its supposedly historic "sins" by appeasing Muslims until they "like us"—and you have a sure recipe for disaster, that is, the current state of affairs. Western people are bombarded with these aforementioned "truths" from the cradle to the grave—from kindergarten to university, from Hollywood to the news rooms, and now even in churches. The essence of all this came out clearly when Obama, in order to rationalize away the inhuman atrocities of the Islamic State, counseled Americans to get off their "high horse" and remember that their Christian ancestors have been guilty of similar if not worse atrocities. That he had to go back almost a thousand years for examples by referencing the crusades and inquisition—both of which have been completely distorted by the warped postmodern worldview, including by portraying imperialist Muslims as victims—did not matter to America's leader. Worse, it did not matter to most Americans. The greater lesson was not that Obama whitewashed modern Islamic atrocities by misrepresenting and demonizing Christian history, but that he was merely reaffirming the mainstream narrative that Americans have been indoctrinated into believing. And thus, aside from the usual ephemeral and meaningless grumblings, his words—as with many of his pro-Islamic, anti-Christian comments and policies—passed along without consequence. Once upon a time, the Islamic world was a super power and its jihad an irresistible force to be reckoned with. Over two centuries ago, however, a rising Europe—which had experienced over one millennium of jihadi conquests and atrocities—defeated and defanged Islam. As Islam retreated into obscurity, the post-Christian West slowly came into being. Islam didn't change, but the West did: Muslims still venerate their heritage and religion—which impels them to jihad against the Western "infidel"—whereas the West learned to despise its heritage and religion, causing it to be an unwitting ally of the jihad. Hence the current situation: the jihad is back in full vigor, while the West—not just its leaders, but much of the populace—facilitates it in varying degrees. Nor is this situation easily remedied. For to accept that Islam condones violent and intolerance is to reject a number of cornerstones of postmodern Western thinking that far transcend the question of Islam. In this context, nothing short of an intellectual/cultural revolution—where rational thinking becomes mainstream—will allow the West to confront Islam head on. Radical Islam is terrorizing the world, not because it can, but because the West allows it to. But there is some good news. With every Islamic attack, the eyes of more and more Western people are opened to the true nature of Muhammad's religion. That this is happening despite generations of pro-Islamic indoctrination in the West is a testimony to the growing brazenness of the jihad. Yet it still remains unclear whether objective thinking will eventually overthrow the current narrative of relativism, anti-Westernism, and asinine emotionalism. Simply put, celebrating multiculturalism and defeating the jihad is impossible. However, if such a revolution ever does take place, the Islamic jihad will be easily swept back into the dustbin of history. For the fact remains: Radical Islam is terrorizing the world, not because it can, but because the West allows it to.